Cytomic's analog-modelling compressor "The Glue" now supports RTAS / Protools. launch product, the bus compressor plugin "The Glue". Pre-release versions of the plugin supplied to key producers have already been used to write a number of Beatport #1s. The new update, meanwhile, allows users of ProTools on Windows, as well as Mac users with Logic running in 64 bit mode (via it's 32 bit bridge). 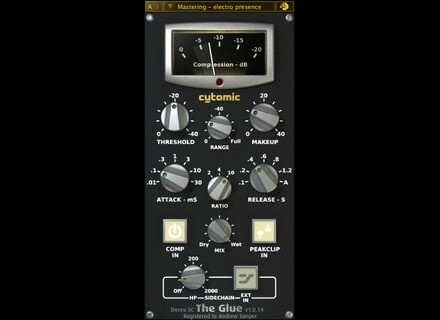 The glue is on sale now for $99 from www.cytomic.com/glue. Big Tick Updates Rhino 2 Big Tick has updated Rhino to v2.06. ProSounds Tau Trance for Predator Pro-Sounds has announced the availability of Tau Trance for Rob Papen's Predator software synthesizer. Orange Amps Announces the OPC Orange Amplifiers, the British based manufacturer of guitar amplifiers, announced the launch of the all-in-one computer amplifier speaker – The OPC.